This InkOwl-brand ink refill kit contains sufficient ink to refill most HP black cartridges at least 32 times. 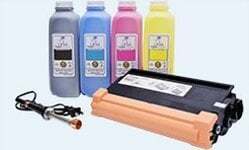 This InkOwl-brand ink refill kit contains sufficient ink to refill most HP black cartridges at least 8 times. 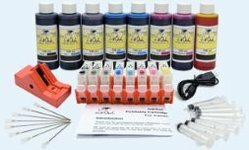 This InkOwl-brand ink refill kit contains enough fade resistant ink to refill most HP color cartridges at least 8 times while printing pictures resistant to fading from UV Rays. This InkOwl-brand ink refill kit contains enough fade resistant ink to refill most HP color cartridges 16 times while printing pictures resistant to fading from UV Rays. It also contains enough ink to refill most HP black cartridges 8 times. 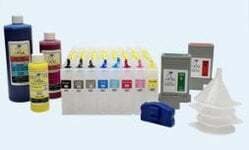 This InkOwl-brand ink refill kit contains enough fade resistant ink to refill most HP color cartridges 8 times while printing pictures resistant to fading from UV Rays. It also contains enough ink to refill most HP black cartridges 8 times. This cartridge is compatible with original HP C8728AN cartridges. This cartridge is compatible with original HP C6656AN cartridges. 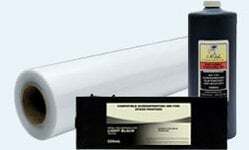 This cartridge is compatible with original HP C6657AN (#57) and CB278AN (#57+) cartridges.